The most common questions that I receive from readers are always hair-related. Unfortunately, I’ve never been able to provide much tips/tricks on my hair care routine or favorite products because I am extremely low maintenance when it comes to my mane. A little background on my hair and almost non-existent hair routine… I wash my hair every other day, although sometimes I go longer, depending on how oily it gets and truthfully, how lazy I am. I don’t use any heat tools and I don’t even think I know how to properly use a curling iron. I don’t blow dry my hair and again, it’s probably due to laziness. I only brush my hair after I wash it and at no other times. I get my hair cut and colored twice a year. I never style my hair other than how it naturally air dries. And I’m clueless about the various hair products out there and will just purchase the first thing I see on the shelf when it comes to shampoo and conditioner. My hair is now down to my chest and a real pain to wash and brush (sometimes painful) so I know that I need to take better care of it. 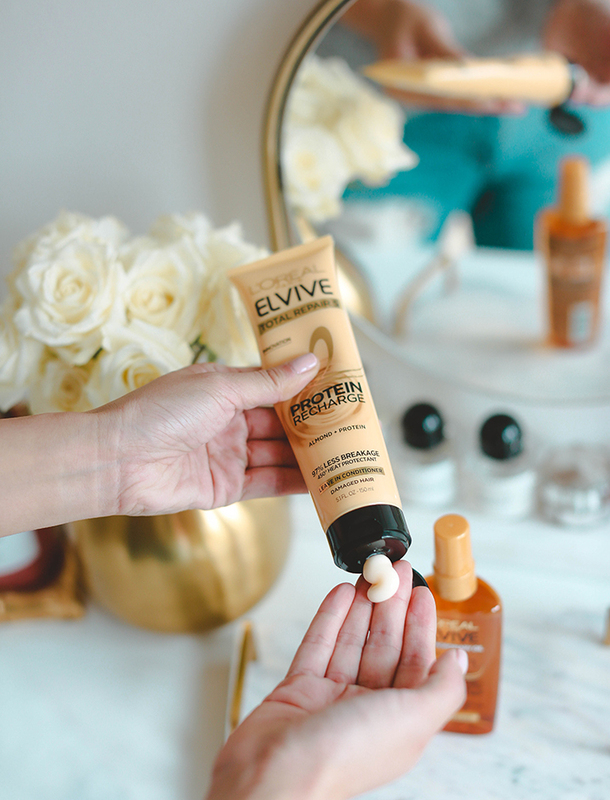 When I found out about L’Oréal® Paris Elvive’s Hair Test, it was the perfect opportunity to help educate and inform myself of the products that I need to implement into my routine. The quiz itself is quick and easy. By answering 3 basic questions: how often my hair felt dry, how easily does a comb slide though when wet, and the type of ends I see most of my hair, the quiz was able to tell that my hair needed a little bit of TLC. The quiz assessed that my hair is at a damage level 3 (out of 5) and recommended the products that I need to help restore it back to optimal health. Be sure to take the test yourself and visit your nearest Walgreens store (click here to find the store nearest you) for an in-person consultation with a L’Oréal Paris expert! You can also find them in the hair care aisle at Walgreens! I was asked to share my experience after just using the products for the first time. At first, I was a little skeptical about what thoughts I could share since I don’t usually notice a difference until a few uses, but I was proven wrong. I was recommended to try both L’Oréal Paris Elvive’s Total Repair 5 Protein Recharge Treatment and Extraordinary Oil Treatment. The Total Repair 5 Protein Recharge is a leave-in hair treatment that is meant to be applied to wet hair. One of the problems that I had is that even though I condition my hair (with a ton of conditioner), I’m still unable to slide a brush through my wet hair. Brushing my hair after I get out of the shower is actually a painful process that I dread because of how much it hurts. With using the Protein Recharge Treatment, it instantly gave new life to my hair. It felt (and looked) healthier, softer, and allowed me to brush my hair with ease. It made complete sense that the other recommended product was the Extraordinary Oil Treatment because of how dry my hair is, due to the harsh chemical process of getting it colored twice a year. I’m always hesitant to use oil in my beauty routine, whether it’s on my hair or my face. I’ve always had a fear of using oil because it would make my hair look greasy and I would have to wash it more frequently, but this product dispelled my fears. The Extraordinary Oil Treatment is a lightweight oil that’s meant for dry, lifeless hair aka my hair. I only used a few small drops and really focused it on the ends where I needed it the most. My hair quickly absorbed it and was given instant shine (but not grease). I really did see results after a single use. I can’t wait to continue using them and can’t even imagine the results after using both products as part of my regular routine. They also have a Total Repair 5 Damage Erasing Balm and Color Vibrancy Repair and Protect Balm that’s included in the Elvive line. 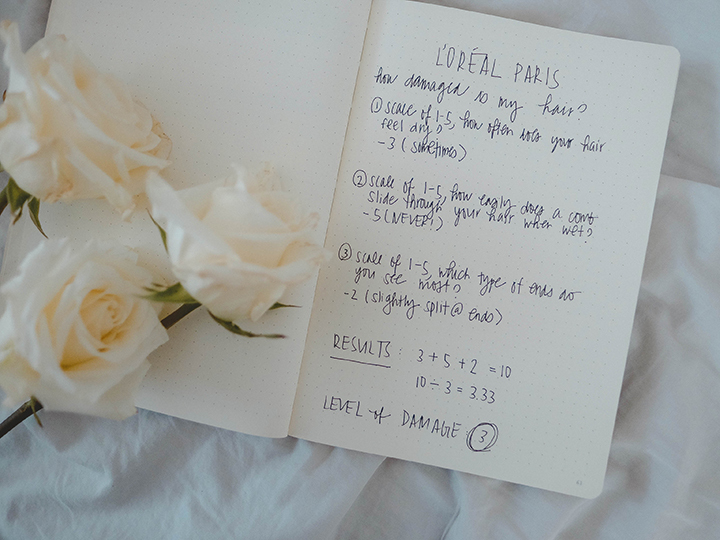 Make sure you take the test yourself and visit your nearest Walgreens store for an in-person consultation with a L’Oréal Paris expert. You can thank me later.